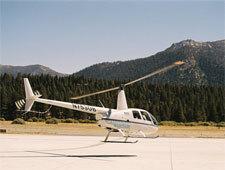 Join Sierra Adventures for a flight over Lake Tahoe and the High Sierra in a helicopter. This is serious fun. Intro: View scenic Lake Tahoe the way it was meant to be seen... by helicopter. There are a variety of flights available, including a spectacular sunset tour of the incomparable Lake Tahoe Basin. The Tour: Your helitour adventure begins with a complimentary weather check, followed by a shuttle pickup for your group at any local hotel. We whisk you off to the Lake Tahoe Airport and your pilot. The helicopter comes equipped with leather seats and Active Noise Reduction headsets so you can enjoy your flight in comfort without any unnecessary noise. With many tour operators, there is a four or five person bench seat in the back, and the people in the middle don't always get the view they paid for. Not our helitour - every seat is a window seat. Approximate duration is governed by type of flight booked.